Of all the central London neighbourhoods, none vaunt quite so many eating and drinking establishments as Fitzrovia. Though there are perhaps more restaurants, cafes, coffee shops and wine bars than there are people – the direct area has very little to offer in terms of other entertainment. Yes, Oxford Street is nearby but for any self-respecting Londoner the busy thoroughfare is a strict ‘no-go’ zone between mid-November and the end of January, once Christmas and the January sales have befallen. So with such a vast selection of places to eat, drink and be merry without much else on offer, there’s an incredible amount of competition. As a result, Fitzrovia restaurants need to be brilliant or to be closed. 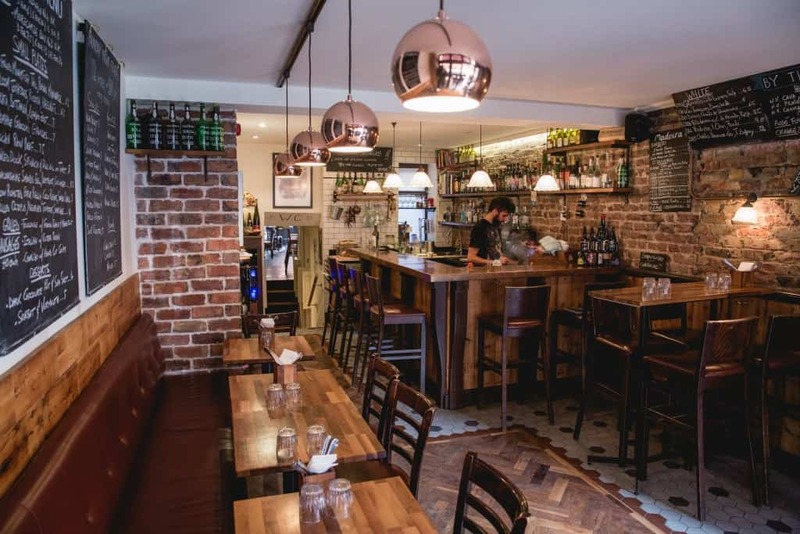 Close to the Euston Road end of Cleveland Street, The Remedy is a cosy wine bar and kitchen, opened earlier this year with a regularly changing food menu. Inside, the décor is suitably casual with lofty bare brick walls, raw wood flooring and blackboards that adorn the walls with chalked menus and wine lists. Typically, we begin with a board containing wafer thin slices of Spanish ham and aged comté. This is paired with a glass of orange wine from the large collection available by the glass, as recommended by the Sommelier. Unlike many natural wines, this particular glass is free from prominent aromas reminiscent of an overpopulated pig sty. One of the three sandwiches on offer, the sourdough cod and oyster sandwich is marvellous. Slabs of cod are gently cooked and breaded like large fish fingers, as is the oyster – it is firm without being tough and loses some of its overbearing salinity in the fryer. As for the sauce, dare I say, it reawakens genuinely pleasant memories of a McDonald’s Big Mac, as it dribbles out of the bread and onto my fingers. That is not to reference the shrunken double-deckers that are on offer today, but the burgers of yesteryear. While they probably haven’t changed much at all, it’s far easier to enjoy something before being force fed terrifying knowledge of pesticides, farm ethics, calories, et al. This sauce has a vibrant yellow complexion and is strong with the taste of dill pickles and generous seasoning, bringing all of the elements of the sandwich together and working exceptionally well with the fish. Tender bullets of favourably al dente Sardinian gnocchi are mixed with a ragu of wild venison that melts on the tongue and has a decadence that somehow compliments the dish’s rich tomato sauce. It is, in fact, the liberal shaving of parmesan that brings the flavours together to work in sweet harmony. After these courses we struggle to find room for dessert, inevitably arriving with more wine, so opt for a sharing dish of chocolate mousse. Arriving in a rustic pottery dish, the mousse is outstandingly indulgent, though a generous topping of flaked sea salt acts as a restraint for the sweetness to become overbearing. In addition, the mousse is so smooth and so light that it’s amongst the best (of many) chocolate mousses I’ve sampled this year. What’s most impressive about the restaurant is the fulfilled promise of an antidote that’s emblazoned above the door. The space and experience is a welcome remedy to the chaos and calamity of Central London. There’s enough choice of wine to excite any vino buff, with accompanying knowledge to match. The food is generally fulfilling, comforting and inventive, plus there’s not a shred of pretension (bar a few customers, perhaps). The Remedy can be found at 124 Cleveland Street, London, W1T 6PG.